Since being diagnosed with multiple sclerosis, The Courage to Give series author Jackie Waldman has found the courage to give and the strength to help others do the same. 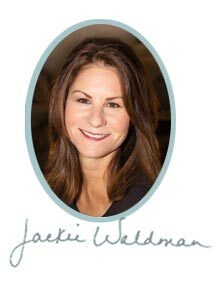 Jackie was living the picture perfect life with three healthy children, a loving husband and a successful business. Then, in 1991, she was diagnosed with multiple sclerosis (MS) and felt her entire world collapse around her. Suddenly, she was immobile-forced to rely on a motorized scooter to get around-and suffering from fatigue. She became withdrawn and depressed. "I kept asking 'Why me?'" Jackie said. "I thought I was being punished for having such a wonderful life." She spent her days feeling sorry for herself, mourning the loss of her old life. She reached a turning point after seeing the movie Schindler's List with a close friend. Inspired and touched by the story, Jackie realized how one person's acts of kindness could make a difference. She thought about how she was treating herself and those she loved, and she realized that true survival was not whether her legs worked. "True survival was about how we treat each other-about love and acts of kindness, no matter what." Suddenly, her pity party ended. The movie inspired Jackie and her friend to organize Random Acts of Kindness™ Week in Dallas, as part of the National Random Acts of Kindness™ Month. The week was a huge success, with participation from Rosa Parks, Martin Luther King III, W. Deen Mohammed and Dennis Weaver, all of whom spoke at rallies, schools and interfaith services. The Dallas Police Department even participated by passing out "Kindness Citations." Jackie had started a great, new tradition for Dallas. Jackie started to feel better. Helping others was helping her. "When Kindness Week was over, I didn't want those feelings to end," Jackie said. She began to volunteer at Our Friends' Place, a safe haven for abused girls in Dallas, and to speak with teens at the Dallas Memorial Center for Holocaust Studies. The more service work she did with teens, the better she felt. Jackie continued to heal the sadness, fear and anger she had lived with for so long. Eager to share the power of giving, she decided to compile a book of true stories to inspire others to have the courage to give. Her first book, The Courage to Give, tells 30 stories of people who have had something happen to them physically and/or emotionally, yet when they started helping others, their lives changed miraculously. When a producer from the Oprah show called Jackie the day after The Courage to Give was released, Jackie was sure it was a friend playing a joke. But it was no joke, she had been invited on the show. Within 36 hours of the show's airing, more than 7,500 people signed up to volunteer with a charity they found using the web site Jackie suggested during the show-www.volunteermatch.org. Since then, Jackie has compiled four more books of inspiring stories about people who have overcome adversity in their lives by finding the courage to give: Teens with the Courage to Give; America, September 11: The Courage to Give; Teachers with the Courage to Give, and her new book now in bookstores, People with MS with the Courage to Give. As a National Ambassador for the National MS Society, Jackie helps other people with MS become aware of the programs and services available to them and ways that they can give back to the Society. She encourages participating in the walks, bike tours, peer counseling and phone buddies, as well as assisting with office help or creating their own ways to give back to others. In October, 2001, she spoke in Omaha, Nebraska, sharing the courage to give message. Afterward, everyone volunteered to do something to help others. "Now that's the courage to give!" Jackie said. Nowadays, Jackie says that having MS has become a blessing. Through her experience with MS, she found the courage to give and the courage to share that message with others. She believes this giving has enriched her life. Jackie encourages others with MS to find the courage to give-to put aside the challenges of the disease and reach out to help someone else-with the hope that they, too, will discover what she continues to learn, that when we help others, we begin to feel better physically and spiritually. Jackie also truly believes that in order to help others, we have to first take care of ourselves. She does so by eating a proper diet, taking yoga and Nia classes, and taking AVONEX® (Interferon beta-1a), a treatment proven to slow the progression of disability in relapsing MS. "I am grateful to have the strength to travel around the country and share the courage to give message," Jackie says. "I believe it is a mind, body, and spirit connection that gives me the energy to do the work." Jackie Waldman was named a CNN millennium hero and has appeared twice on Oprah; she has worked with hundreds of teens and adults advocating volunteerism.